I got a little Funko Pop! bobblehead of Spider-Gwen! I finished one of my Spider-Gwen graphic novels that one of my best friends gave me and I loved it! How can I not love a spunky superhero who is a drummer in all-ladies rock and roll band when she’s not webbing around?! My list of badass ladies to admire just keeps growing..but let’s go back to my number one: my Ahsoka Tano!! Season 2 of Star Wars Rebels came out on DVD and Blu-Ray last week so, that’s basically what I’ve been doing…sorry, productivity! 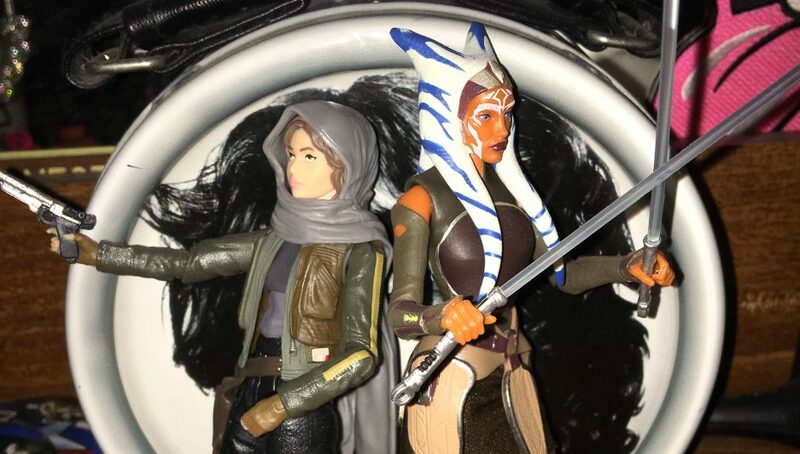 I’m not done yet, because I’m savoring every episode and Rebels Recon, and perhaps watching some scenes over and over again, like Ahsoka’s battle scene with the Seventh Sister (voiced by Sarah Michelle Gellar aka BUFFY aka Freddie Prinze Jr.’s Wife!) in the “Future of the Force” episode. Ahsoka is just phenomenal, so elegant and fierce in her combat. Also, I tweeted about my wonderful purchase and I how spent the rest of that day and Freddie Prinze Jr. AND Ashley Eckstein herself liked my tweet!! It’s the little things that make my day. Is it weird I feel like she’s my little Jedi guardian? But really, this decal is amazing and I’ve never seen anything like it until I found this Etsy shop. There’s also a grown-up, Rebels version of Ahsoka that is amazing, but I chose this one because I’m more attached to her Clone Wars look. Speaking of Rebels, there’s an amazing one of Hera as well, but I don’t consider myself enough of a Hera fan to get it, but it’s pretty cool. There’s also a little BB-8 one I have my eye on to order possibly sometime in the nearish future. Sorry for the lack of posts lately, I lack both the inspiration and the time lately. Alas, I’ll be back shortly, possibly returning with some book reviews! I recently purchased a Black Widow novel called Forever Red, and the cashier at the book store was curious how it would compare to the comics. I only just got into Spider-Gwen but now I need some Black Widow comics as well to compare to this novel I’m excited to read! !